Anyone that has an e-mail address is likely to suffer from unwanted spam to one degree or another. If you have multiple e-mail addresses, then you are immediately multiplying your chances of receiving increased amounts of spam. This is exactly the situation that I inadvertently found myself in by running a number of different websites, each with a different e-mail address. Every morning (or more realistically at the crack of noon) I would log on and download my e-mails. However, as a few of my e-mail accounts received all the mail addressed to the e-mail’s domain, I was beginning drown in a sea of spam from e-mails sent to random addresses at one or two of my key domains. This was driving me to distraction. I wasted a significant amount of time every day scanning through my junk mail folder in Microsoft Outlook, checking to see if any legitimate e-mails had ended up there (as they often do). Not to mention the astronomical e-mail onslaught that I was faced with if I dared to go away for a few days. Things had to change! I used Microsoft Outlook as my e-mail client to download mail from four separate POP3 accounts at my internet service provider (ISP). Outlook was set to check and download the e-mail from these accounts every five minutes. Three of the accounts were for single e-mail addresses, which attracted a little spam, but not excessively so. My big problem was with the fourth account (my main account), which received any e-mail sent to the domain. This meant that if a spammer tried sending an e-mail to a random mail address at my domain, I would receive it. E.g. About a year ago, a good friend of mine gave me a retired retired Dell PowerEdge 2850 rack server, ex of Zen Internet. My intended usage for it being a development web server running Ubuntu, following a complete upgrade of my home networking infrastructure. However, having this server running 24/7, plus being a Linux server (Linux servers are often used as mail servers on the Internet) it seemed like an ideal opportunity to make use of its facilities and spare capacity to fix my spam problem. With a little research I soon formed a plan of action based on a variety of software packages that were readily available for the Linux environment. My plan was to use the Linux server to automatically download and filter my e-mails from the ISP’s servers at regular intervals and then use Outlook on my PC to connect to the Linux server to download the pre-filtered e-mails. The first job required of the server was to automatically download my e-mails from the POP3 accounts on the remote mail servers. Fortunately, this was remarkably straightforward using fetchmail, a remote-mail retrieval and forwarding utility. I tend to use Webmin (a web-based interface for Unix system administration) for the majority of the administration tasks on my Linux server, which makes most administrative tasks a doddle. 14:     is myemail             # deliver downloaded mail to local email account "myemail"
Fetchmail was now configured to check my e-mail accounts automatically and download all mail from these accounts to a single e-mail account on the local server. Progress was being made as I now had an automated system for downloading my e-mails, but unfortunately they were all now stuck in a single e-mail account on Postfix on my Linux server. I now needed Microsoft Outlook on my Windows PC to be able to connect to the Linux server and download the collected e-mails. This I accomplished using Dovecot (an IMAP/POP3 mail server) on the Linux server. Dovecot was fairly straightforward to set-up. Essentially I had to tell it what mail transfer protocols to use (POP3 in my case), what authentication systems to accept (Plain-text) and where to find the downloaded mail files (/var/mail). All other settings seemed to work fine in their default states. 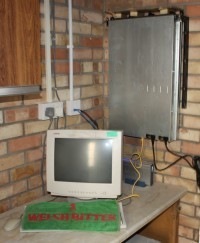 The Dovecot server was also configured to start automatically on system boot-up. The next piece in the jigsaw was to configure my Microsoft Outlook e-mail client to check for e-mails from my now local mail server via Dovecot, instead of the ISP’s remote mail servers. This was just like setting up any normal e-mail account in Microsoft Outlook. I set the account details to POP3, entered the IP address of my local server for the incoming e-mail, but left the outgoing e-mail server as that of my existing ISP’s e-mail server. The final details required were the username and password for the Linux e-mail account where all the downloaded mail was being deposited. Bingo! It worked, although with all this effort I was still not really any further forward with my original plan to reduce the amount of spam e-mails that I was getting. However, everything was now in place for the next link in the chain, which would hopefully accomplish what I was after. Part 2 of this post details how I configured my Linux server to filter out the Spam in a two stage process to only allow through the e-mails that I actually wanted, leaving my inbox fresh and clean. I hear that crown prince Umbawujinga died recently without any next of kin. His vast fortune is festering in a Nigerian bank account. As soon as you send me your bank details we can split it. Deal?